Our Amazon Local Associates page is a "Physically FITch-approved" one-stop-shop for all things food, fun, and fitness. Real talk: We decided to become a participant in this program because many of our clients want to eat healthy. Like ourselves, our clients are busy, hardworking people who do not always have the time to locate and purchase an item. Please know that we are offering this site as a convenience and we will never incentivize clients for shopping our page on Amazon. Physically FITch will continue to promote and support our fellow local businesses. "The Local Associates program removes the risks associated with the cost and availability of inventory and presents an opportunity to fulfill any customer need above and beyond what is available in store or what your space allows." Have you ever wanted to raid Jen's kitchen/pantry/fridge/freezer? Check back weekly to find her favorite items and go-to kitchen staples. Looking for a specific item? We're here to help! Send us a detailed message and we'll send you our recommendation! As I’m sure you’ve experienced, making healthier eating decisions isn’t always easy—for you or your budget! It can be especially challenging making the time to grocery shop for everyday ingredients to make sure you and your family have the healthiest meals possible. Fortunately, there’s a better way. There is a revolutionary online marketplace on a mission to make healthy living easy and affordable for everyone. 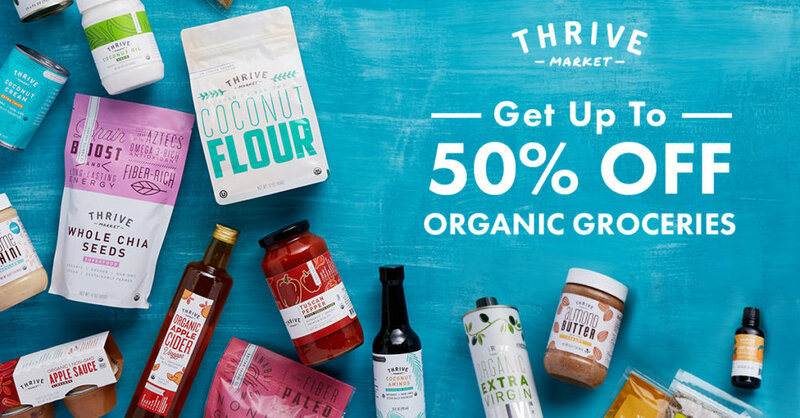 Thrive Market makes healthy living — even for the busiest lifestyles — easier than ever. They take the hassle out of healthy living -- offering organic foods, along with nontoxic home and personal care essentials for 25-50% off what you’d normally pay in a store—and deliver everything right to your door. You can get everything you need: organic, non-GMO food, snacks, vitamins, supplements, personal care products, eco-friendly cleaning supplies, safe and nontoxic beauty products, kitchen staples, home goods, organic baby food, kid’s products and much, much more! For every membership purchased, Thrive Market gives a free membership to a low-income family to help make healthy living easy and affordable for everyone. The stuff you have to have, delivered to your door. Jet has free shipping over $35, 2-day delivery on thousands of essentials, and 24/7 US-based customer service— no membership needed. Shop gluten-free, dairy-free, Paleo, and more!